Billions of you have watched their videos and millions of you have followed them on social media. 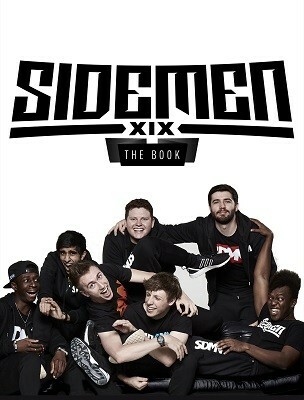 So here we go; it's time to back up because YouTube superstars, The Sidemen, are finally here in book form and they're dishing the dirt on each other as well as the YouTube universe. There's nowhere to hide as the guys go in hard on their living habits, their football ability, and their dodgy clobber, while also talking Fifa, Vegas and superheroes. They'll also give you their grand house tour, letting you in on a few secrets, before showing you their hall of fame, as well as revealing some of their greatest shames. Along the way you'll learn how seven of the world's biggest YouTube stars started off with nothing more than a computer console, a PC and a bad haircut before joining forces to crush the internet. And they'll tell you just how they did it (because they're nice like that) with their ultimate guide to YouTube while also sharing their memories of recording their favourite videos as well as a typical day in the life of The Sidemen. You'll feel like you're with them every step of the way, smelling the 'sweet' aroma of the boys' favourite dishes in the kitchen, stamping your passport as you follow them on their trips around the world and kicking every ball as the boys gear up for the biggest football match of their lives. It's going to get personal. It's going to get intense, and JJ is going to have lots of tantrums, so take a moment to prepare yourself, because this is The Sidemen book you've been waiting for! I have wated sooo long for this.. Yaayyy! !